I realised I have not been posting bridal nails.. So here's 2 sets I did last Dec (I think?). 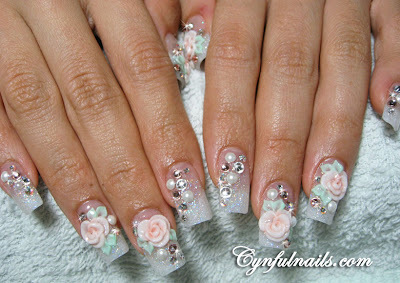 White glitter tips with pearls crystals and peach roses. Pink with lace, ribbons and some disco balls. love it...love it....do you use fake nail and decorate them?or they are your real nail? have you ever done any pointy/almond shaped nails? i would love to see some from you. wah i also like the bridal design. cham im suckered into the pink and glitter!! !